Columbus’s current favorability rating hovers somewhere close to those of Hillary Clinton and Donald Trump. This was not always the case – he was once a revered figure who represented the American dream. The King and Queen of Spain revoked their initial support for his first voyage to the New World because Columbus’s demands for nobility and hereditary rights were so excessive. The monarchs changed their minds only after it was calculated that the expedition would cost Spain the equivalent of $7,000 (in 2016 dollars). Isabella did not have to “hock her jewels” to foot the bill. Columbus’ personal qualities led to his downfall. In 1496, he became governor of the colony based at Santo Domingo, modern Dominican Republic – a job he hated. He could not convince the other colonists, especially those with noble titles to follow his leadership. And, he was an incompetent administrator. The colony was largely a social and economic failure. The wealth that Columbus promised the Spanish monarchs failed to materialize, and he made continuous requests for additional support. Finally, he left the colony to go exploring. Conditions were so dire by 1500, the Crown sent Francisco de Bobadilla to investigate. Bobadilla’s first sight, at the mouth of the Ozama River, was four Spanish “mutineers” hanging from gallows. Under authority from the King, Bobadilla arrested Columbus and his brothers and sent them to Spain in chains. Columbus waited seven months for an audience at the court. He refused to have his chains removed until the meeting and even asked in his will to be buried with the chains. 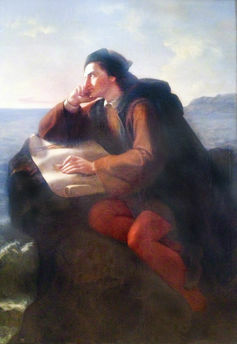 Although the Spanish rulers wanted Columbus to disappear, he was allowed one final voyage from 1502 to 1504. He died in 1506, and went virtually unmentioned until he was resurrected as a symbol of the United States. My interest in this American icon began 35 years ago with a search for his first landfall. I wanted to understand the man who wrote the only accounts of the Native Bahamians, known today as Lucayans. In the mid-18th century, scholars brought to light long forgotten documents about Columbus and the early history of the New World. Among the most important was Bartolome de las Casas’ three volume, “Historia de las Indias.” This book had been suppressed because it documented Spain’s harsh treatment of the Native peoples. It is the foundation for the “Black Legend” – a depiction that “blackened” Spanish character by depicting it as repressive, brutal, intolerant, and intellectually and artistically backward. The second was the personal journal of Christopher Columbus from his first voyage, published in 1880. Gustavus V. Fox, Abraham Lincoln’s Assistant Secretary of the Navy, used the latter in his attempt to determine the first island on which Columbus landed. In 1828, American writer and author of The Legend of Sleepy Hollow, Washington Irving, attempted to revive his flagging career by writing the first biography of Christopher Columbus in English. His embellishments created the great hero whose legend we continue to celebrate: “He was one of those men of strong natural genius, who appear to form themselves; who, from having to contend at their very outset with privations and impediments, acquire an intrepidity in braving and a facility in vanquishing difficulties.” And, Irving wrote that Columbus was the first to believe in a round earth – a fact that was proved 1,000 years before Columbus. Renewed scholarly interest in Columbus coincided with political motives to deny Spain any remaining claims in the Americas. Spain’s American colonies declared independence, one by one, from the beginning of the 19th century. Simón Bolivar, and other Creole revolutionary leaders, embraced a broader philosophy which highlighted their Roman ancestry. The complete conversion of Spanish America to Latin America arrived with the U.S. invasion of Cuba and the six month Spanish-American War in 1898. The last of Spain’s colonies were liberated. In 1889, France put on what reviewers described as the most spectacular World’s Fair possible. Held on the Champs de Mars in Paris, it’s crowning achievement was the Eiffel Tower. For some reason, the U.S. did not realize that it needed to put on a good show in Paris. Europeans viewed the poor quality of the exhibits as a reflection of U.S. inferiority. Looking West From Peristyle, Court of Honor and Grand Basin of the 1893 World’s Columbian Exposition. After the embarrassment in Paris, the United States wanted to prove to the world it was the equal of Europe. Cities across the country competed to host a fair in the U.S. Chicago wanted to demonstrate it was equal to the older eastern cities of New York and Philadelphia and submitted the winning bid. No one has claimed credit for the theme of the Exposition, but the timing was fortuitous. The Columbian Exposition and World’s Fair was timed to coincide with the 400th anniversary of Columbus’ arrival in the New World. President William H. Harrison presided over opening ceremonies on Oct. 12, 1892. It was called the “White City” – collection of nine “palaces” designed by America’s greatest architects, conceived and constructed in only 26 months. Outside the White City was the grittier Midway, which is now a common feature of carnivals and fairs. The Fair debuted the first Ferris wheel, and gave visitors their first taste of carbonated soda, Cracker Jack, and Juicy Fruit chewing gum. An enormous 264-feet tall Ferris wheel transported 36 cars each carrying up to 60 people on a 20 minute ride. More than 28 million tickets were sold during the six months the Columbian Exposition was open. Seventy-one portraits of Columbus, all posthumous, hung in a Grand Gallery. Following Washington Irving’s descriptions, Columbus became the embodiment of the American Dream. The son of simple wool weavers and someone who had a great dream, challenged the greatest scholars of his day, and boldly went where no man had gone before. Better yet, he was Italian. The world could deny that Spain had any part in the discovery of the Americas. President Harrison declared a national holiday – Columbus Day – to coincide with opening of the Columbian Exposition. It was officially recognized by Congress in 1937. Columbus the man died more than 500 years ago. Columbus the legend is still being dismantled. His story illustrates the blurred borders between myth and history – how an architect of destruction can be turned to a national symbol. William Francis Keegan, Professor of Anthropology, University of Florida.